For centuries, the Radix existed in rumor and secrecy. Saints whispered its legend. Alchemists craved its power. Armies fought and died to possess it. Five hundred years ago, it vanished from the earth. History's greatest mystery, lost to the ages. The Radix tells the story of a legendary relic thought to possess extraordinary powers. Paleopathologist and elite government agent John Brynstone is the latest in a series of adventurers and researchers who have searched for the Radix. Across continents, Brynstone and his team must unravel riddles and ancient mysteries no one has been able to solve for five centuries. He's not alone in his quest. The modern-day descendants of the infamous Borgia family will stop at nothing to wield the power of the Radix. At the same time, another organization has sent a nameless assassin to kill Brynstone before he can steal their prize. What will happen when the truth is revealed behind the Secret of Secrets? Join John Brynstone on an adventure that promises historical mysteries, psychological thrills, nonstop action, and international suspense. 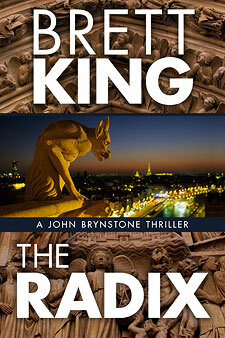 "Brett King's The Radix is a gem of a novel, a thrilling blend of historical mystery and modern intrigue. Lightning paced and expertly told, here is a debut not to be missed!" "A topnotch Thriller! Part Da Vinci Code, part 24, The Radix is roller-coaster storytelling at its best." "The Radix brims with rich detail, in a story fraught with action, suspense, and intrigue. The reader is in highly capable hands with Brett King—a fresh, exciting voice in the international suspense genre. Settle back, enjoy the ride, and savor this debut." "Brett King has spun a hair-raising adventure that propels us from the ski slopes of Aspen, Colorado to the secret turrets, hovering high above Paris, of the ancient Notre Dame cathedral. The Radix is a relentless, plot-twisting, labyrinthine quest to decipher the medieval mystery of the "Voynich Manuscript"—a very real tome that still conceals an arcane code that no secret service agency-including the CIA and KGB—has been able to crack in the past five-hundred-years." "A pulse-pounding thrill ride of a book."